Many readers have written to me to say that Yashim’s exploits have inspired them to visit, or re-visit, Istanbul – where the official city guides, as it happens, recommend the Yashim series to prospective tourists, as a gentle introduction to the city’s long and tumultuous story. My thanks to them all. If any further spur was required, then Cornucopia should provide it. 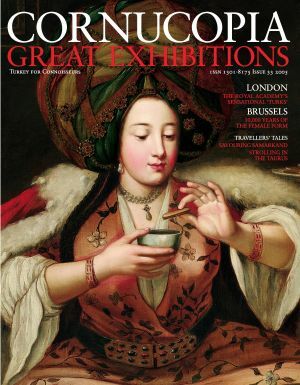 Cornucopia describes itself as ‘the Magazine for Connoisseurs of Turkey’, and it is that and more. It is an astonishingly beautiful magazine, published quarterly, with features on everything from old Bosphorus interiors to nomads of the steppe, from attar of roses to neolithic Anatolia, very lavishly illustrated, as the brochures would say, and intelligently written. One way to look at what it has to offer is via this link, which begins with a review of the Yashim books by Barnaby Rogerson, author and publisher at Eland Books – of whom, and of which, more in a later post. A browse through the website to begin with is highly recommended!